"We don't think animals or humans are necessarily interested in fairness per se. 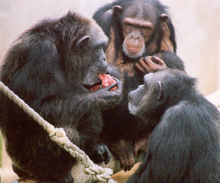 They are interested in keeping good relations, which is why they pay attention to reward division," says Frans de Waal. The sense of fairness did not evolve for the sake of fairness per se but in order to reap the benefits of continued cooperation, so say Frans de Waal, PhD, and Sarah Brosnan, PhD, co-authors of a review article about inequity aversion (IA), which is defined as a negative reaction to unequal outcomes. The review is published in Science. Their conclusion comes after the co-authors reviewed more than 35 IA-related studies to address their hypothesis that it is the evolution of forestalling partner dissatisfaction with obtained outcomes and its negative impact on future cooperation that allowed the development of a complete sense of fairness in humans. de Waal is director of the Living Links Center at the Yerkes National Primate Research Center, Emory University, and a C.H. Candler Professor of Psychology at Emory. Brosnan is associate professor in the Departments of Psychology and Philosophy, and a member of the Neuroscience Institute and Language Research Center at Georgia State University. The authors focused on literature related to IA in humans and other animals within an evolutionary framework of cooperation, social reciprocity and conflict resolution. They further divided IA into sub categories of disadvantageous or first-order IA, to represent reactions to divisions detrimental to the subject, and advantageous or second-order IA, reactions to divisions that are beneficial to the subject. First-order IA, the co-authors say, is the most common in humans and animals, and it emerges earlier and is more pronounced in humans. Also among their findings is that there is less evidence that nonhuman species seek to equalize outcomes to their own detriment, that inequity responses are most pronounced in animals that cooperate outside of the bonds of mating and kinship, and that proximity, rank, gender and relationship quality affect outcomes. "Our review relates IA to cooperation by showing how the reaction is stronger in cooperative animals, and how it fosters future cooperation by keeping the partner happy," says de Waal. "We don't think animals or humans are necessarily interested in fairness per se. They are interested in keeping good relations, which is why they pay attention to reward division," de Waal continues. This is not the first time de Waal and Brosnan have collaborated on a fairness-related project. It was their research with capuchin monkeys in 2003 that led to the discovery of IA. In that study, they showed monkeys work well on a simple task if both get cucumber (a perceived lower-value item) or both get grapes (a perceived higher-value item), but that the animals' responses become erratic if one gets grapes and the other cucumber. The one with the lesser reward stops performing, starts to refuse rewards and becomes agitated, actively rejecting and throwing away its food. According to de Waal, "When the study was published in Nature, some scientists found it outrageous that monkeys might have a sense of fairness while others tried to conduct their own studies to prove it true. It became quickly clear that studies in which monkeys received food without working on a task did not find the same effect because the actual task was part of the equation." Since then, the effect has been confirmed for other monkey species as well as for chimpanzees (great apes), dogs and crows, and, de Waal says, is now thought to be a fairly general pattern. de Waal also adds, "Our research continues a long tradition of cooperation studies at the Yerkes National Primate Research Center. As noted in our review, the first experimental study of cooperation in primates dates to 1936 with a Yerkes-based experiment of cooperatively pulling chimpanzees." Within the fields of microbiology and immunology, neurologic diseases, neuropharmacology, behavioral, cognitive and developmental neuroscience, and psychiatric disorders, the center’s research programs are seeking ways to: develop vaccines for infectious and noninfectious diseases; understand the basic neurobiology and genetics of social behavior and develop new treatment strategies for improving social functioning in social disorders such as autism; interpret brain activity through imaging; increase understanding of progressive illnesses such as Alzheimer’s and Parkinson’s diseases; unlock the secrets of memory; treat drug addiction; determine how the interaction between genetics and society shape who we are; and advance knowledge about the evolutionary links between biology and behavior.